Sophie always had a big stomach but we looked on the internet and everywhere reassured us that this was normal for a baby and toddler. We first took Sophie to the GP in April 2011 to ask them to feel Sophie’s stomach just to put our minds at rest that nothing was wrong. We also asked the GP to listen to Sophie’s breathing because this sounded heavy. The GP assured us that Sophie would grow into her stomach and said that we should buy a humidifier to help with her breathing. We became concerned again when staff atSophie’s nursery noticed that one side of her stomach was hard. We went back to the GP and this time asked to be referred to a paediatrician. 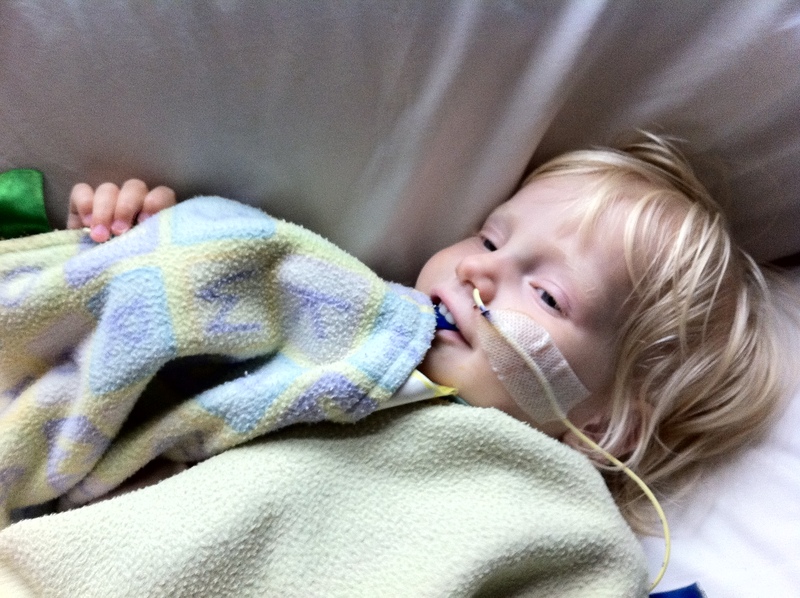 We had a feeling that something was not quite right but nothing could have prepared us for the paediatrician looking at Sophie and saying ‘you poor thing’ and then proceeding to tell us that she thought that she had a tumour in her liver. We began a whirlwind of tests the next day that confirmed that Sophie did indeed have Hepatoblastoma and even worse that it has spread to her lungs and that the overall survival rate for this type of cancer is just 30%. Our journey of hospital visits, chemotherapy, tests, operations and continual worry and anxiety had begun. 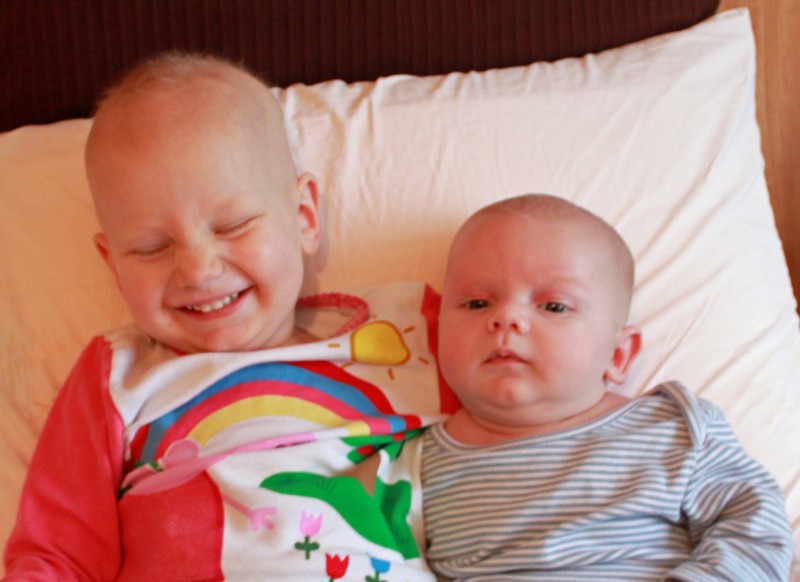 Sophie started chemotherapy at the Royal Marsden on the 28th June and went through 3 cycles of high toxicity chemotherapy, which often resulted in stays in our local hospital for infections. Sophie coped well with the treatment and continued to be her smiley and cheeky self, blowing kisses to the nurses and throwing her pushchair and baby down the slopes in the hospitals. Meanwhile we had discovered that we were due to have a little brother for Sophie in November, very near her own birthday; a piece of good news for us to focus on. 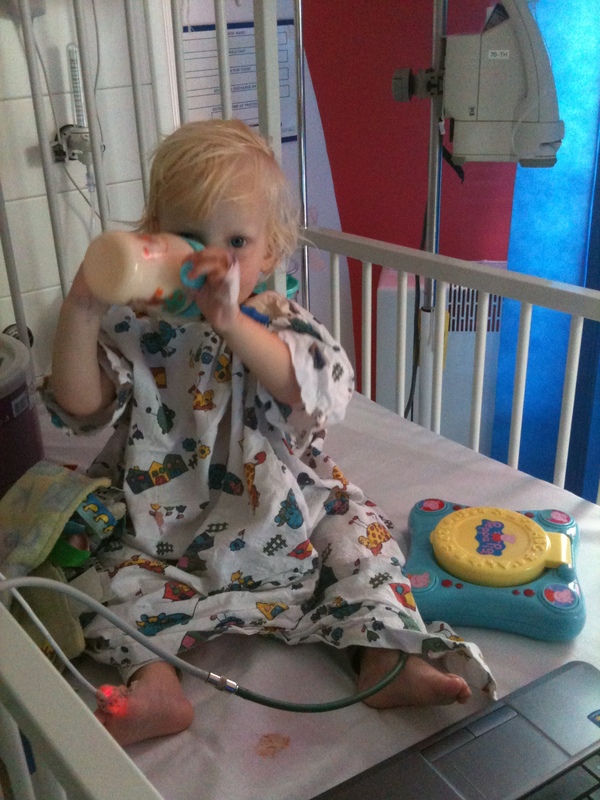 On 16th November 2011 Sophie had her liver tumour successfully removed at Kings College Hospital. 25% of her liver was removed during the operation and after an awful three days in intensive care Sophie was back to her normal happy self. Sophie also had a lovely birthday present as on 25th November her baby brother James was born, we’re not sure if they’ll appreciate having the same birthday in years to come but it will save us a fortune in birthday parties! James was due the day after Sophie’s operation but had considerately hung on so that we could spend all the time needed with Sophie after her operation. Even though Sophie’s primary tumour had been removed we knew that the real battle was about to begin as ensuring that Sophie’s lungs were clear was essential for Sophie’s good long term prognosis. Sophie started chemotherapy again in late November and her tumour marker dropped to within the normal range in early December. However, a CT scan showing that she still had multiple lung metastasis left in both of her lungs led to concerns that the tumours in her lungs had changed into a more aggressive form of liver cancer, hepatocellular carcinoma, that is resistant to chemotherapy and therefore very hard to treat. We had an incredibly difficult wait over Christmas to see if she would respond to another round of chemotherapy, including spending Christmas Eve and New Year’s Eve in hospital. Sophie was booked in an all-important for a CT scan in mid-January but the day before she started to be unwell and it was found that she had a Hickman line infection which led to an emergency operation to remove and replace it and an even longer wait. Fortunately the CT scan showed that she had responded to the chemotherapy and she then had two further rounds to try to completely clear her lungs. 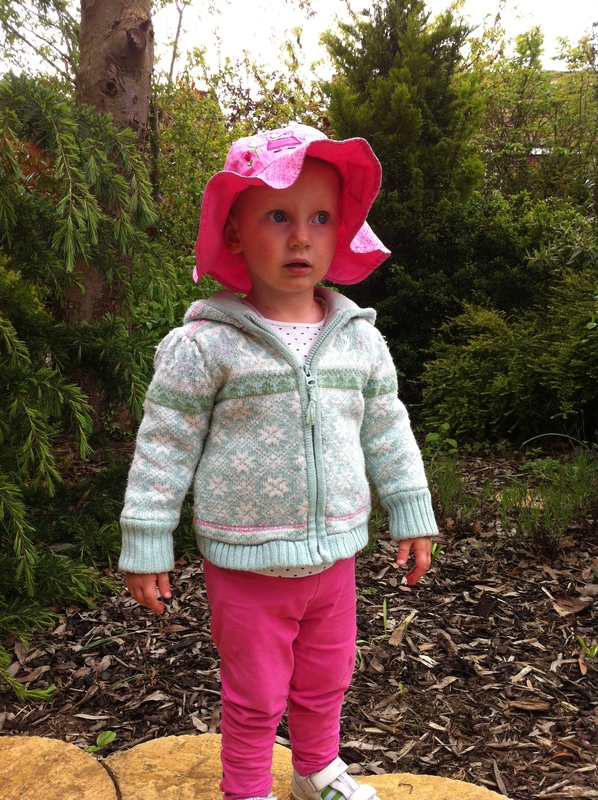 On 15th March 2012 we were told that Sophie was in remission. Some residual microscopic nodules were present on the final CT scan but we were told that these should be dead tissue as her tumour marker had been low for so long. We were of course ecstatic and looked forward to life slowly returning to normal for Sophie. However Sophie’s tumour marker started to climb at the end of April 2012 and a CT scan on 3rd May showed that the cancer was back. We were shocked and devastated as this meant that the cancer was very aggressive and treatment options were now limited with surgery being thought to be the best bet. Sophie started on new chemotherapy whilst we were waiting to hear back from surgery teams and thankfully has responded well to it. Two separate surgery teams in the UK came back to say that they would not operate at this time as they did not think that they could remove all of the metastasis. We had read good things about treatment in the US for Hepatoblastoma lung metastasis and decided to seek a third opinion from Sloan-Kettering Memorial Cancer Centre in New York. Thankfully the surgery team there has agreed to do surgery giving Sophie what we feel is her best chance of survival. We are currently awaiting a firm surgery plan and date. Sophie’s fight goes on… we hope you can help her. Hi, thanks for your comment and offering to help. St George’s, The Royal Brompton and Great Ormond Street all reviewed her case and said they could not do the surgery, so we referred her case to Sloan-Kettering in New York. We’ve also contacted our local MP who has referred the matter to Andrew Lansley, who is the Secretary of State for Health. We’re waiting to hear back but I imagine this could take some time. Take care, Andrew and Ruth. My name is Haatchi and my mummy and daddy adopted me in February 2012 after having a very horrible start in life. I am celebrating my first birthday in July and we have decided to raise money for Sophie in lieu of gifts. We have also sent a request to the Make A Wish Foundation for you as I won the Drontal Give Your Dog A Bone Award top prize which we are donating to MAW. I am going to ask if this prize can be donated to you. I live in Hampshire so if Sophie likes big fluffy dogs I would be happy to visit. sophie keep fighting as i’m going to try and raise money for you good luck!!!!! Keep fighting, little lady! I’m encouraging everyone I know to make a donation – I’ve been moved to tears by this story and I’m not prone to over-emotionalism (well, that’s not entirely true since I’ve become a father myself!). Good luck on the fundraising…it’s been wonderful to see the total accellerate over the course of this evening after the spot on the BBC news! As for you, Mummy and Daddy,hang in there…I’m sure that every parent in the south who has seen that news article has you in their thoughts and prayers. You are all in my thoughts. I’ve donated on the just giving page and shared with all my contacts on facebook who I know will also donate what they can. I hope you reach your target very soon and Sophie can get the treatment she so needs. I’m a parent of two children myself and Sophie’s (and your) battle reduced me to tears – stay strong and a big kiss for your little girl. I think its so sad that your little girl has cancer. Why is it that all the good people contract things like cancer. Why can’t it be the bad people in prison that get such horrible illnesses. I hope she recovers and the cancer goes away forever. I have just been reading your story with tears down my face as my 2 year old daughter is currently fighting the same battle in Royal Manchester Children’s Hospital. Emilie is just starting her 3rd course if chemo before we move to Leeds where they will investigate and check the metastasis have gone in her lungs, if so they will hopefully be performing a liver transplant using half my liver. Emilie has stage 4 with lung and abdomen metastasis following a major bleed from the tumour in the first 2 weeks of treatment. My heart goes out to you and your family as I know first hand what a brave little girl you are being. Keep strong all of you and I hope sincerely the hospital in New York cone through for you.